Some people eat just to live. For others, colloquially known as foodies, eating is the reason to live. Foodies’ lives are enriched by the act of eating great food. Some love to cook gourmet meals, while others like to go to sit-down restaurants and have gourmet meals prepared for them. For others still it’s the ingredients that are the most important, with questions like, “is the food sourced locally?” and “is this produce high quality?” looming large. 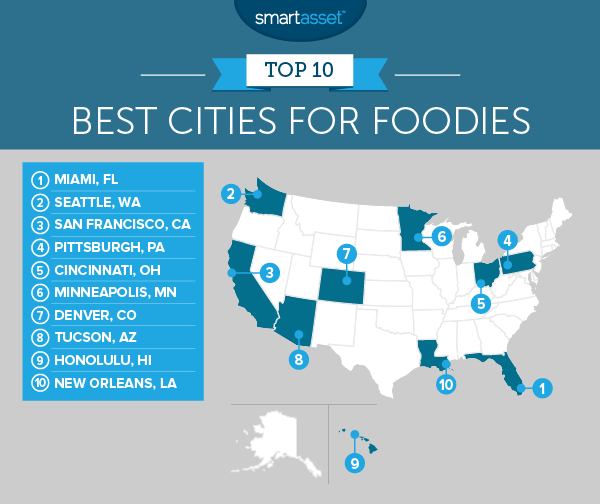 We looked at data on these and other factors to determine the best cities for foodies. Check out SmartAsset’s cost of living calculator. In order to rank the best places for foodies, we gathered at data for seven different factors. We looked at the total number of restaurants, the ratio of full-service restaurants to limited-service restaurants, the number of restaurants per 10,000 residents, the number of specialty grocery stores, the percent of total workers who work in the food industry, the number of farmers markets and community-supported agriculture (CSA) per 100,000 residents and the price of a three-course meal for two at a mid-tier restaurant. To see where we got all the data and how we put it together to create our final ranking, check out the data and methodology section below. No NYC – New York is famous for quite a few things, food included. But it didn’t make this list. The problem is that it’s extremely crowded, so New York took a hit on metrics which took population into consideration. For example, New York has the most restaurants in the country at 6,996 but for restaurants per capita it ranked third-to-last. It’s also expensive. West Coast, best coast – The West Coast contains five of the top 20 best cities for foodies with two – Seattle and San Francisco – ranking in the top 5. Both cities have a plethora of restaurants for food lovers to check out. Don’t sleep on the Midwest – While the Midwest may not immediately come to mind for many thinking about great food cities, our data shows that ignoring the region would be a mistake. Six Midwest cities, Cincinnati, Minneapolis, Milwaukee, Madison, Omaha and Chicago, made the top 25. Foodies who care about fresh ingredients may be particularly happy in the Midwest as many of those cities rank well for number of farmers’ markers and community-supported agriculture. Miami grabbed the top spot as the best city for foodies. Foodies here will appreciate the large number of restaurants, as well as the wide variety of specialty grocery stores. Miami ranked in the top 10 for both of those metrics. Plus, it has some of the best Cuban food in the U.S. But foodies on a budget may want to do most of their eating at home as dining out in Miami can cost a pretty penny. Numbeo data shows that the average meal at a mid-tier restaurant for two runs about $70. That’s one of the highest prices in the country. Fresh off being named the best city for coffee lovers, we found that Seattle is also great for foodies. Seattle has one of the highest ratios of sit-down restaurants to fast food restaurants, and the seventh-most restaurants per 10,000 residents so you shouldn’t need to look too hard to find somewhere to eat. If you’re more into whipping up feasts at home, Seattle’s got you covered. It has the 10th-most specialty grocery stores so if you’re looking for specialty items, you can head to places like Pike Place Fish Market, Uwajimaya supermarket or butcher shops. For foodies looking for a place to sit down and enjoy table service, San Francisco will be hard to beat for variety. Data from the Census Bureau shows there are two sit-down restaurants for every fast food joint in the City by the Bay. San Francisco is famously expensive though and meals are no exception. A meal for two at a mid-tier restaurant will run about $75 on average, according to Numbeo data. That’s the second-highest cost in our study (after New York). Pittsburgh is climbing the culinary charts. Zagat even named it the best food city of 2015. One great thing about Pittsburgh – other than 43 restaurants per 10,000 residents (third-most in the country) and 5.5 community-supported agriculture and farmers’ markets per 100,000 residents (sixth-most in the country) – is the prices. Relative to other large cities, especially those in our top 10, you can get a good deal in Pittsburgh. Going out to eat with a friend at a mid-tier restaurant in the Steel City should only cost you about $50, on average. Cincinnati residents are famous for their love of chili. Indeed chili is Cincinnati is a $250 million business. But there’s more to love in Cincinnati than just the chili. Here, foodies should be able to find fresh, locally sourced ingredients. Cincinnati has the seventh-most community-supported agriculture and farmers’ markets per 100,000 residents. Anthony Bourdain recently cited Minneapolis as a city with good food and great chefs during a Reddit AMA, and we have the data to back him up. 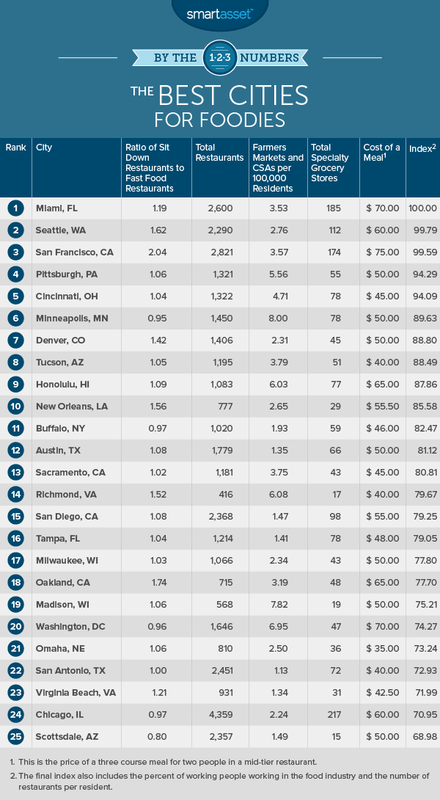 Minneapolis has the sixth-most restaurants per resident (36 per 10,000 residents) and the 17th-most total restaurants at 1,450. Minneapolis also has the highest number of CSA and farmers’ markets per 100,000 residents. Denver is famous for its Rocky Mountain oysters. The Mile High City has over 1,400 restaurants so there’s probably fierce competition for who serves the best ones. Game meat, like elk and venison, is also popular here. Denver is famous for having the largest Cinco de Mayo parade in the country, so it makes sense that good Mexican food is readily available. It also has the third-highest ratio of sit-down restaurants to fast food places in the top 10. In 2015, UNESCO named Tucson a Captial of Gastronomy. To date, it’s the only city in the United States to be bestowed with this honor. Tucson has the 14th-highest ratio of people working the food industry and the 12th-highest rate of CSA and farmers’ markets in the study, to go along with the recognition from UNESCO. Being located on a tropical island, Honolulu is one of the best places in the country to get fresh fruits and fresh seafood. Honolulu has six CSA and farmers’ markets per 100,000 residents, the second-highest rate in the top 10. Headed to Honolulu? Don’t miss trying poke, a mainstay in Hawaiian cuisine that’s recently hit it big on the mainland. If you’re not familiar with the dish, it’s a raw fish salad that’s typically served as an appetizer. New Orleans rounds out the best cities for foodies. It has a rich history of bringing together different culinary traditions to create something unique. Gumbo, jambalaya, po’ boys and beignets are all examples of delicious dishes that are plentiful in the Big Easy. New Orleans has the third-highest percentage of people working in the food industry. According to Census data, 9.8% of New Orleans workers are employed in the food industry is some capacity, from head chef to waiter. Total number of restaurants. Data comes from the U.S. Census Bureau’s 2014 Business Patterns Survey. The ratio of full service restaurants to limited service restaurants. This shows how many sit-down restaurants there are compared to fast food restaurants. A higher number reflects a larger presence of full service restaurants. We considered this a positive for the purposes of this study. Data comes from the U.S. Census Bureau’s 2014 Business Patterns Survey. The number of restaurants per 10,000 residents. The restaurant data comes from the U.S. Census Bureau’s 2014 Business Patterns Survey and the population data comes from the U.S. Census Bureau’s 2015 5-Year American Community Survey. Total number of specialty grocery stores. This counts establishments like fish and seafood markets, fruit and vegetable markets, baked good and confectionery stores and nut stores. Data comes from the U.S. Census Bureau’s 2014 Business Patterns Survey. The percent of all employees who work in the food preparation and service industry. This measures how much of the population works in the food industry, but also how important food is to the local economy. Data comes from the U.S. Census Bureau’s 2015 5-Year American Community Survey. The number of community-supported agriculture and farmers’ markets per 100,000 residents. Data comes from the United States Department of Agriculture Marketing Service. The price of a three-course meal for two at a mid-tier restaurant. Data comes from Numbeo.com. We ranked each city across each of the seven factors. We gave double weighting to the ratio of full service restaurants to limited service restaurants and half weight to the percent of workers employed in the food industry and the price of a three-course meal for two. All other metrics received a full weighting. After ranking each city we averaged those rankings. The city with the highest average ranking received a score of 100 and the city with the lowest average ranking received a score of 0.